Product #17468 | SKU VCLHG0872K | 0.0 (no ratings yet) Thanks for your rating! 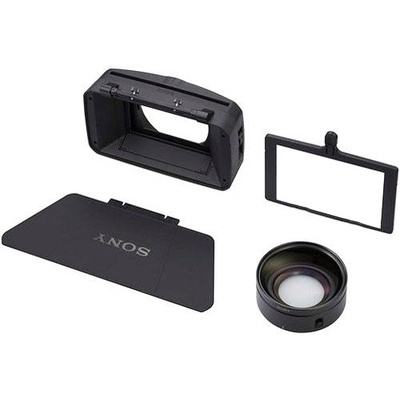 The Sony VCLHG0872K is a wide conversion lens kit for the Sony HVR-Z5U camcorder. This kit contains the lens, bayonet mount sunshade with integrated filterholder, French flag and pouch. This kit is specially designed to fit the Sony HVR-Z5U and works to widen the field of view for small spaces and moving camera applications. The bayonet mount sunshade allows for attachment to the camcorder and features a filterholder for 10.16 x 14.35 cm filters, a French flag and lens shutter for light control.